Chromosomal rearrangements involving the gene that encodes the RET tyrosine kinase are known oncogenic drivers in 1% to 2% of patients with non–small cell lung cancer (NSCLC). These RET rearrangements occur with characteristic partners, most commonly KIF5B, but also CCDC6, NCOA, TRIM33, CUX1, KIAA1217, FRMD4A, and KIAA1468. They are typically identified in young patients with adenocarcinoma histology and minimal smoking history. 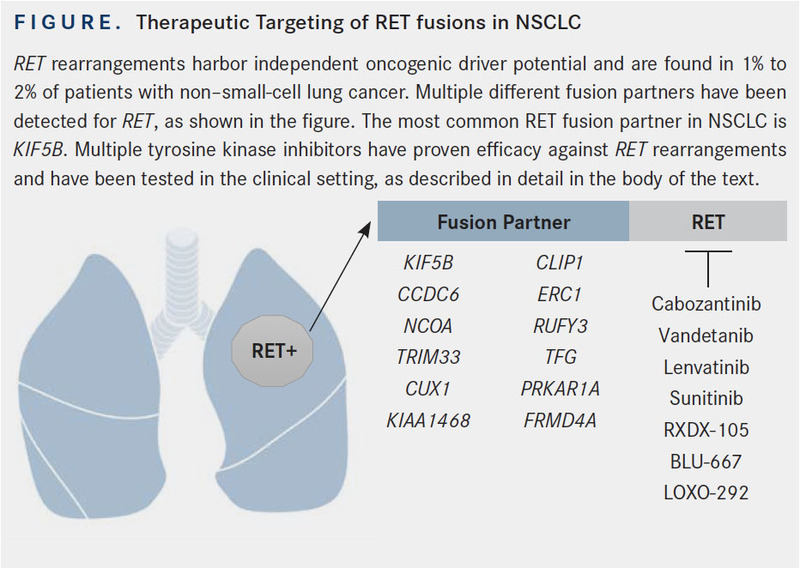 Therapeutic targeting of RET-fusion–driven NSCLCs has taken the form of treatment with broad-spectrum tyrosine kinase inhibitors with anti-RET activity, such as cabozantinib (Cabometyx; Cometriq), vandetanib (Caprelsa), lenvatinib (Lenvima), RXDX-105, and sunitinib (Sutent). Cabozantinib and vandetanib have been the most heavily studied multi-kinase inhibitors (MKIs), with response rates of 20% to 50% in largely pretreated patients with RET-rearranged NSCLC. Sunitinib has been used in fewer patients to date with initial results demonstrating a 22% response rate. RXDX-105 has exhibited uniquely impressive response rates (75%) in patients with non–KIF5B-RET-fusion NSCLC, compared with 0% response in patients with KIF5B-RET-fusion–positive NSCLC. BLU-667 has demonstrated an objective response rate of 50% in patients with RET-fusion positive NSCLC, and LOXO-292 reported a 74% ORR in patients with RET-fusion positive NSCLC. Notably, RXDX-105, BLU- 667, and LOXO-292 have all demonstrated some central nervous system activity in these early phase trials. Future directions of RET inhibition in patients with RET-rearranged NSCLC include additional clinical validation of the next generation RET-selective inhibitors RXDX-105, BLU-667, and LOXO-292 and comparing multikinase inhibitors with RET-selective inhibitors to determine the optimal sequencing of RET-targeted therapies. The 5 most heavily studied agents in patients with RET-rearranged NSCLC have been cabozantinib, vandetanib, lenvatinib, RXDX-105, and sunitinib. Less-specific MKIs with some anti-RET activity that have been used in patients with RET-rearranged NSCLC include sorafenib, alectinib (Alecensa), nintedanib (Ofev; Vargatef), ponatinib (Iclusig), and regorafenib (Stivarga).28 More recently, early clinical results with RET-selective inhibitors RXDX-105,29 BLU-667,30 and LOXO-292,31 have also been reported. The previously discussed MKIs have biochemical activity against RET but were not designed to selectively target RET. RET-driven NSCLC are not optimally RET-selective. More recently, the results of early clinical trials with RET-selective inhibitors, RXDX-105,29 BLU-667,30 and LOXO-292,31 have been reported. As recently reported at the European Society of Medical Oncology 2017 Congress, RXDX-105 is a VEGFR-sparing RET inhibitor with activity against patient-derived xenograft tumor models harboring RET rearrangements39; it has been applied to patients with varying tumor histologies harboring RET rearrangements and RET mutations.29 In a multicenter phase I/Ib clinical trial, an established phase II dose of 275 mg daily was determined. No patients had received previous RET inhibitor therapy. A total of 21 patients with RET-rearranged NSCLC were treated in the phase Ib expansion cohort, and among 8 patients with non–KIF5B-RET fusions, the ORR was 75% (6/8), including a central nervous system (CNS) response in 1 patient. However, among 13 patients harboring KIF5B-RET fusions, none had an objective response. The most common grade 3 AE was rash (10%), and no grade 4 or 5 AEs occurred.29 Experimental studies have not yet identified a unique basis for KIF5B-RET insensitivity to RET inhibition compared with non–KIF5B-RET sensitivity (Figure). In the dose escalation cohort the maximum tolerated dose was determined to be 400 mg daily. The ORR for all 40 response evaluable patients was 45%, and of these 40 patients 53% (n=21) had received prior RET-directed MKI treatment. In patients with RET-mutated PTC the ORR was 40% (10/25), and in patients with RET-fusion NSCLC the ORR was 50% (7/14). While PFS and OS data are not mature, adverse events were reported, and the only grade >2 adverse event that occurred in more than 5% of patients was hypertension (>grade 2 in 8% of patients). Other grade 3 adverse events included neutropenia in 2 patients, leukopenia in 1 patient, ALT increase in 1 patient, fatigue in 1 patient, and diarrhea in 1 patient. There were no grade 4/5 adverse events. Importantly, CNS activity was reported in one patient with KIF5B-RET fusion NSCLC. LOXO-292 is another RET-selective TKI that was strategically designed to maximize on-target activity while minimizing activity against other kinases. 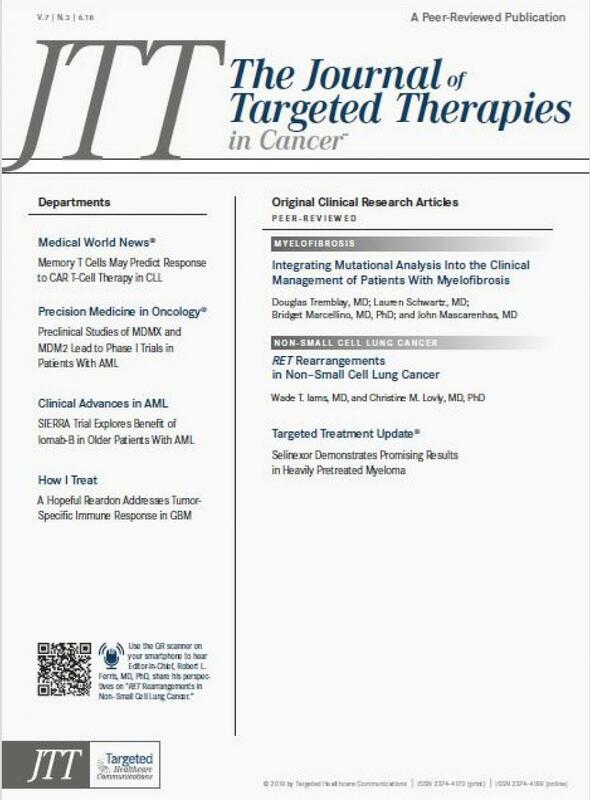 Results from a multi-histology phase I basket trial of this novel agent in patients with RET-driven malignancies was recently presented at the American Society of Clinical Oncology Annual Meeting in 2018.In the dose escalation cohort, patients with NSCLC, PTC, MTC, and RET-fusion positive pancreatic cancer (2 patients) were included. In this cohort, 66% (n=55) of patients had previously received a RET-directed MKI. The maximum tolerated dose was not reached, and the maximum dose administered in trial was 240 mg twice daily. 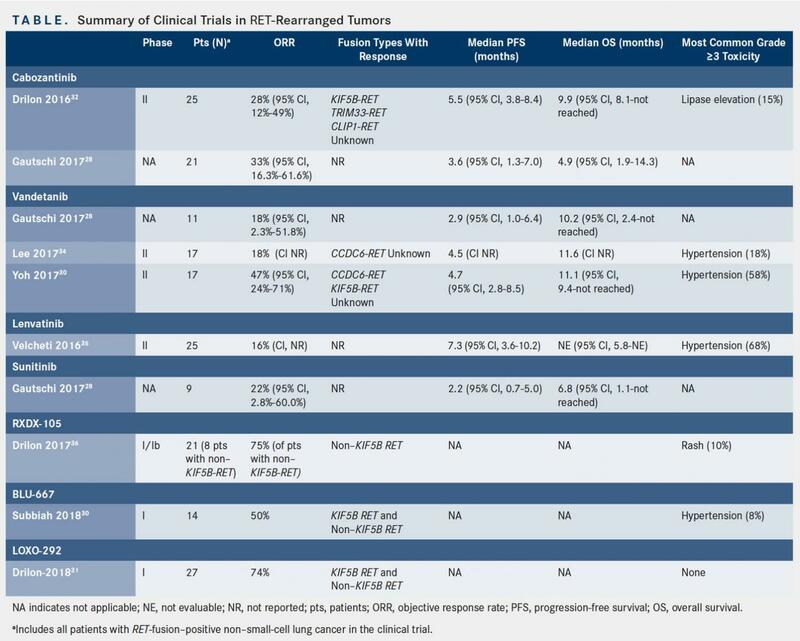 The confirmed ORR in 34 evaluable patients was 74% (25/34), including a 74% (20/27) confirmed ORR in patients with RET-fusion NSCLC and 33% (6/18) confirmed ORR in patients with RET-mutant MTC. Responses were seen in both patients with KIF5B-RET fusions and non-KIF5BRET fusion NSCLC. There were 10 patients with CNS metastases, and 3 of 3 patients with measurable CNS disease had CNS responses, including one patient with CLIP1-RET fusion NSCLC. The only grade >2 adverse events reported were grade 3 dyspnea, grade 3 tumor lysis syndrome, and grade 3 increase ALT. The 2 most heavily studied RET inhibitors have been cabozantinib and vandetanib, and these agents have demonstrated response rates between 20% and 50% in a majority of patients who have received 2 or more lines of systemic therapy. Tolerability has been manageable with these agents, with lipase elevation the most common grade 3 toxicity observed with cabozantinib and hypertension the most common grade 3 AE seen with vandetanib. While lenvatinib has proven excessively toxic and sunitinib has not been broadly applied in patients with RET-rearranged NSCLC, RXDX-105 has shown notably higher response rates in patients with non-KIF5B-RET–fusion NSCLC, and phase I clinical trials have demonstrated promise for the RET-selective inhibitors, BLU-667 and LOXO-292. Future directions for this exciting avenue of clinical research include further testing of the RET-selective inhibitors in larger patient cohorts, identifying the optimal sequence of RET inhibitors, and defining mechanisms of acquired resistance to both MKIs and RET-selective inhibitors. Ishizaka Y, Itoh F, Tahira T, et al. Human ret proto-oncogene mapped to chromosome 10q11.2. Oncogene. 1989;4(12):1519-1521. Schuchardt A, D’Agati V, Larsson-Blomberg L, et al. Defects in the kidney and enteric nervous system of mice lacking the tyrosine kinase receptor Ret. Nature. 1994;367(6461):380-383. Andrew SD, Capes-Davis A, Delhanty PJ, et al. Transcriptional repression of the RET proto-oncogene by a mitogen activated protein kinase-dependent signalling pathway. Gene. 2002;298(1):9-19. Arighi E, Borrello MG, Sariola H. RET tyrosine kinase signaling in development and cancer. Cytokine Growth Factor Rev. 2005;16(4-5):441-467. Wells SA Jr, Santoro M. Targeting the RET pathway in thyroid cancer. Clin Cancer Res. 2009;15(23):7119-7123. doi: 10.1158/1078-0432.CCR-08-2742. Nakamura T, Ishizaka Y, Nagao M, et al. Expression of the ret proto-oncogene product in human normal and neoplastic tissues of neural crest origin. J Pathol. 1994;172(3):255-260. Takahashi M, Buma Y, Iwamoto T, et al. Cloning and expression of the ret proto-oncogene encoding a tyrosine kinase with two potential transmembrane domains. Oncogene. 1988;3(5):571-578. Ibañez CF. Structure and physiology of the RET receptor tyrosine kinase. Cold Spring Harb Perspect Biol. 2013;5(2). doi: 10.1101/cshperspect.a009134. Edery P, Lyonnet S, Mulligan LM, et al. Mutations of the RET proto-oncogene in Hirschsprung’s disease. Nature. 1994;367(6461):378-380. Romeo G, Ronchetto P, Luo Y, et al. Point mutations affecting the tyrosine kinase domain of the RET proto-oncogene in Hirschsprung’s disease. Nature. 1994;367(6461):377-378. Gainor JF, Shaw AT. Novel targets in non-small cell lung cancer: ROS1 and RET fusions. Oncologist. 2013;18(7):865-875. doi: 10.1634/theoncologist.2013-0095. Drosten M, Pützer BM. Mechanisms of disease: cancer targeting and the impact of oncogenic RET for medullary thyroid carcinoma therapy. Nat Clin Pract Oncol. 2006;3(10):564-574. Saito M, Ishigame T, Tsuta K, et al. A mouse model of KIF5B-RET fusiondependent lung tumorigenesis. Carcinogenesis. 2014;35(11):2452-2456. doi: 10.1093/carcin/bgu158. Li F, Feng Y, Fang R, et al. Identification of RET gene fusion by exon array analyses in “pan-negative” lung cancer from never smokers. Cell Res. 2012;22(5):928-931. doi: 10.1038/cr.2012.27. Cai W, Su C, Li X, et al. KIF5B-RET fusions in Chinese patients with non-small cell lung cancer. Cancer. 2013;119(8):1486-1494. doi: 10.1002/cncr.27940. Matsubara D, Kanai Y, Ishikawa S, et al. Identification of CCDC6-RET fusion in the human lung adenocarcinoma cell line, LC-2/ad. J Thorac Oncol. 2012;7(12):1872- 1876. doi: 10.1097/JTO.0b013e3182721ed1. Lee MS, Kim RN, I H, et al. Identification of a novel partner gene, KIAA1217, fused to RET: functional characterization and inhibitor sensitivity of two isoforms in lung adenocarcinoma. Oncotarget. 2016;7(24):36101-36114. doi: 10.18632/oncotarget.9137. Takeuchi K, Soda M, Togashi Y, et al. RET, ROS1 and ALK fusions in lung cancer. Nat Med. 2012;18(3):378-381. doi: 10.1038/nm.2658. Ju YS, Lee WC, Shin JY, et al. A transforming KIF5B and RET gene fusion in lung adenocarcinoma revealed from whole-genome and transcriptome sequencing. Genome Res. 2012;22(3):436-445. doi: 10.1101/gr.133645.111. Kohno T, Ichikawa H, Totoki Y, et al. KIF5B-RET fusions in lung adenocarcinoma. Nat Med. 2012;18(3):375-357. doi: 10.1038/nm.2644. Lipson D, Capelletti M, Yelensky R, et al. Identification of new ALK and RET gene fusions from colorectal and lung cancer biopsies. Nat Med. 2012;18(3):382-384. doi: 10.1038/nm.2673. Kohno T, Nakaoku T, Tsuta K, et al. Beyond ALK-RET, ROS1 and other oncogene fusions in lung cancer. Transl Lung Cancer Res. 2015;4(2):156-164. doi: 10.3978/j. issn.2218-6751.2014.11.11. Wang R, Hu H, Pan Y, et al. RET fusions define a unique molecular and clinicopathologic subtype of non-small-cell lung cancer. J Clin Oncol. 2012;30(35):4352-4359. doi: 10.1200/JCO.2012.44.1477. Suehara Y, Arcila M, Wang L, et al. Identification of KIF5B-RET and GOPC-ROS1 fusions in lung adenocarcinomas through a comprehensive mRNA-based screen for tyrosine kinase fusions. Clin Cancer Res. 2012;18(24):6599-6608. doi: 10.1158/1078-0432.CCR-12-0838. Yokota K, Sasaki H, Okuda K, et al. KIF5B/RET fusion gene in surgicallytreated adenocarcinoma of the lung. Oncol Rep. 2012;28(4):1187-1192. doi: 10.3892/or.2012.1908. Seo JS, Ju YS, Lee WC, et al. The transcriptional landscape and mutational profile of lung adenocarcinoma. Genome Res. 2012;22(11):2109-2119. doi: 10.1101/gr.145144.112. Su AI, Cooke MP, Ching KA, et al. Large-scale analysis of the human and mouse transcriptomes. Proc Natl Acad Sci U S A. 2002;99(7):4465-4470. Gautschi O, Milia J, Filleron T, et al. Targeting RET in patients with RETrearranged lung cancers: results from the global, multicenter RET registry. J Clin Oncol. 2017;35(13):1403-1410. doi: 10.1200/JCO.2016.70.9352. Drilon AE, Liu S, Doebele R, et al. LBA19-A phase 1b study of RXDX-105, a VEGFRsparing potent RET inhibitor, in RETi-naive patients with RET fusion-positive NSCLC. Ann Oncol. 2017;28(suppl_5): v605-v649. Subbiah V, Gainor JF, Rahal R, et al. Precision targeted therapy with BLU-667 for RET-driven cancers. Cancer Discov. 2018. doi: 10.1158/2159-8290.CD-18-0338..
Drilon A, Rekhtman N, Arcila M, et al. Cabozantinib in patients with advanced RETrearranged non-small-cell lung cancer: an open-label, single-centre, phase 2, singlearm trial. Lancet Oncol. 2016;17(12):1653-1660. doi: 10.1016/S1470-2045(16)30562-9. Yoh K, Seto T, Satouchi M, et al. Vandetanib in patients with previously treated RET-rearranged advanced non-small-cell lung cancer (LURET): an open-label, multicentre phase 2 trial. Lancet Respir Med. 2017;5(1):42-50. doi: 10.1016/ S2213-2600(16)30322-8. Suzuki M, Makinoshima H, Matsumoto S, et al. Identification of a lung adenocarcinoma cell line with CCDC6-RET fusion gene and the effect of RET inhibitors in vitro and in vivo. Cancer Sci. 2013;104(7):896-903. doi: 10.1111/cas.12175. Gautschi O, Zander T, Keller FA, et al. A patient with lung adenocarcinoma and RET fusion treated with vandetanib. J Thorac Oncol. 2013;8(5):e43-e44. doi: 10.1097/JTO.0b013e31828a4d07. Falchook GS, Ordoñez NG, Bastida CC, et al. Effect of the RET inhibitor vandetanib in a patient with RET fusion-positive metastatic non-small cell lung cancer. J Clin Oncol. 2016;34(15):e141-e144. doi: 10.1200/ JCO.2013.50.5016. Lee SH, Lee JK, Ahn MJ, et al. Vandetanib in pretreated patients with advanced non-small cell lung cancer-harboring RET rearrangement: a phase II clinical trial. Ann Oncol. 2017;28(2):292-297. doi: 10.1093/annonc/mdw559. Velcheti V, Hida T, Reckamp KL, et al. Phase 2 study of lenvatinib (LN) in patients (pts) with RET fusion-positive adenocarcinoma of the lung. Ann Oncol. 2016;27(suppl 6):abstr 1204PD. doi: 10.1093/annonc/mdw383. Li GG, Somwar R, Joseph J, et al. Antitumor activity of RXDX-105 in multiple cancer types with RET rearrangements or mutations. Clin Cancer Res. 2017;23(12):2981-2990. doi: 10.1158/1078-0432.CCR-16-1887. Minocha M, Khurana V, Qin B, et al. Co-administration strategy to enhance brain accumulation of vandetanib by modulating P-glycoprotein (P-gp/ Abcb1) and breast cancer resistance protein (Bcrp1/Abcg2) mediated efflux with m-TOR inhibitors. Int J Pharm. 2012;434(1-2):306-314. doi: 10.1016/j. ijpharm.2012.05.028. Subbiah V, Berry J, Roxas M, et al. Systemic and CNS activity of the RET inhibitor vandetanib combined with the mTOR inhibitor everolimus in KIF5B-RET re-arranged non-small cell lung cancer with brain metastases. Lung Cancer. 2015;89(1):76-79. doi: 10.1016/j.lungcan.2015.04.004. Vaishnavi A, Schubert L, Rix U, et al. EGFR mediates responses to small-molecule drugs targeting oncogenic fusion kinases. Cancer Res. 2017;77(13):3551-3563. doi: 10.1158/0008-5472.CAN-17-0109. Nelson-Taylor SK, Le AT, Yoo M, et al. Resistance to RET-inhibition in RETrearranged NSCLC is mediated by reactivation of RAS/MAPK signaling. Mol Cancer Ther. 2017;16(8):1623-1633. doi: 10.1158/1535-7163.MCT-17-0008.